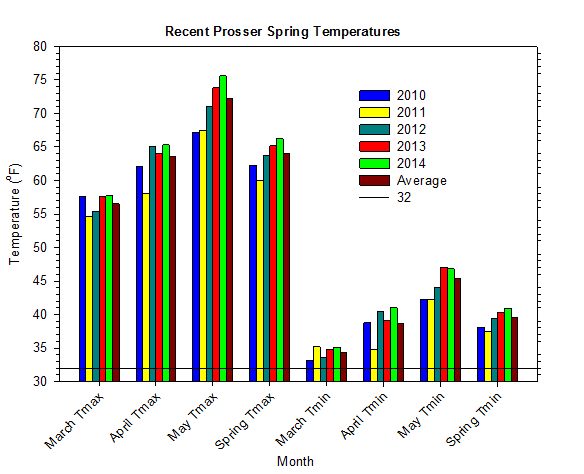 Twenty years have passed since Prosser last experienced a spring as warm as 2014. This year also marks the continuation of an exceptional reversal of recent fortunes. 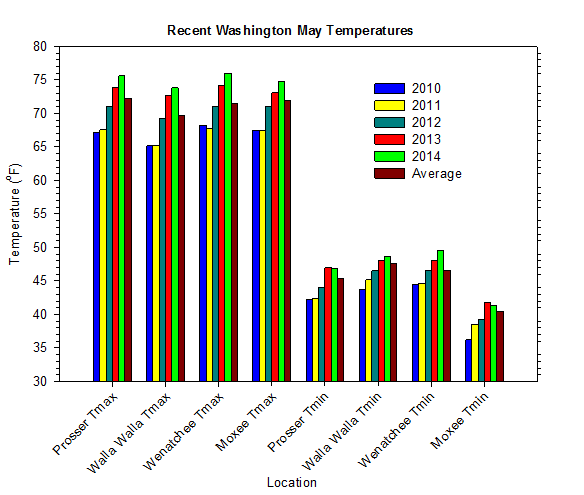 During the early part of the present decade, cool spring weather was rather commonplace in Washington. Just 3 years ago, Washington observed near-record cold temperatures to start the growing season. In 2014, however, the mean May high temperature was more than 8 degrees warmer than in 2011, while the mean spring high temperature eclipsed its 2011 counterpart by a margin of greater than 6 degrees. Overall, May and the spring of 2014 were warmer than 2011 by 7.1 and 5.2 degrees, respectively. Despite their modest appearance, these numbers are significant changes for one and three-month average values. Interestingly, the spring season began on a cold note. Green Bluff (near Spokane) recorded a high temperature of only 19 degrees on March 1st. However, arctic air rapidly retreated from eastern Washington, and warm conditions dominated for the remainder of the spring. The period from March 2nd to 8th was unusually wet, and Montesano recorded nearly 8 inches of rain during the week-long deluge. April was a generally unremarkable time, except for the coastal heat wave at month's end. The high temperature at Long Beach soared from 58 degrees on the 28th to 88 degrees on the 30th. 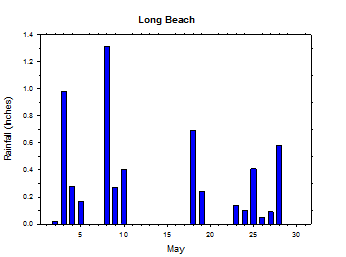 The abnormally early hot spell culminated with Long Beach recording their warmest April temperature on record, while simultaneously surpassing their hottest temperature of 2013. Overall, the month of May can be characterized with the following simple formula: Heat wave. Cool down. Repeat. Seattle soared to 89 degrees on the 1st, but reached only 69 degrees on the very next day. Another heat wave later in the month sent temperatures soaring above 90 degrees in northwestern Oregon on May 14th. Other notable May events include 1.7 inches of rainfall at Stevenson on the 9th, and a 30-degrees low temperature at Ritzville on the morning of May 27th. May began with very hot temperatures and mostly sunny skies. A strong ridge of high pressure along with dry offshore flow initially made western Washington the hottest part of the state. However, an approaching upper low and a return to onshore flow allowed for a rapid high temperature drop in western areas on May 2nd. Areas such as Seattle reached 89 degrees on the 1st, but only 69 degrees on the 2nd, and 61 degrees on May 3rd. Lows on the 2nd were as warm as 64 degrees, but mainly in the 40s and 50s. Meanwhile, highs reached the 80s to low 90s in much of central Washington. Simultaneously, western areas experienced notable cooling, with Long Beach peaking at just 57 degrees. On May 3rd, highs reached the mid 60s to low 70s in central areas, and mainly the upper 50s to mid 60s elsewhere. Lows were mostly in the mid 40s to mid 50s. 1.5 inches of rain fell at Tokeland, with some wet weather in most western areas. Highs on the 4th were in the mid 50s to low 70s, with lows in the upper 30s to low 50s. 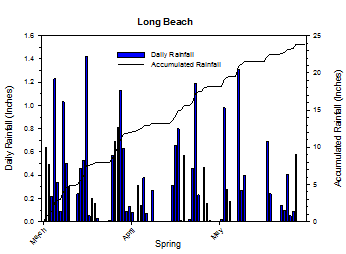 Rain fell over nearly the entire state on the 8th, with 1.33 inches recorded at Long Beach. Highs ranged from the mid to upper 50s in southwestern Washington to the 60s and 70s east of the mountains. Lows were in the mid 30s to low 50s. It was windy in the east on May 9th, with isolated significant rain totals and cool temperatures. Highs only reached into the 50s and 60s, with lows in the upper 30s to low 50s. 1.7 and 1.3 inches fell at Stevenson and Stanwood, respectively. Highs on the 10th ranged from the mid 60s to low 70s in central areas to the mid to upper 50s in eastern areas. Lows were in the 30s and 40s, with 0.2 inches of rainfall at the coast. Highs on May 14th reached the low 90s in northwest Oregon, and 89 degrees at Long Beach. Central areas climbed into the 80s, with 70s in eastern border areas. Lows varied from the upper 30s to around 60 degrees. On May 15th, parts of central Washington again topped 90 degrees, although the coast was already experiencing notable cooling. Highs on the 18th reached the upper 50s to mid 70s, with lows in the mid 30s to mid 50s. 0.82 inches of rain fell at Long Beach, as breezy winds persisted in many areas. High temperatures peaked in the 60s and 70s on May 19th, with lows in the upper 30s to mid 50s. Conditions were mostly dry with isolated showers. The 20th was a calmer and warmer day. Highs ranged from the upper 70s to low 80s in central areas to the 60s at the coast. Lows were in the 40s to mid 50s. Temperatures peaked on the 22nd, before slightly more unsettled conditions arrived for the Memorial Day Holiday Weekend. After a very mild morning on the 23rd, a weak front brought rain to western areas, along with breezy and ultimately cooler conditions to the state. Western areas reached the 60s to low 70s, while central areas topped out in the mid 70s to mid 80s. Lows ranged from the mid 40s to low 60s. 1.2 inches of rain fell in western Whatcom County, although amounts were lighter over the remainder of western Washington. Low temperatures on May 27th were as cold as 30 degrees at Ritzville, but predominantly in the upper 30s to 40s. High temperatures reached the 60s and 70s. Light rain fell around Long Beach and Pullman on the unstable spring day. Highs on the 28th ranged from 52 degrees at Garfield East to 74 degrees at Orondo. Lows varied from 36 degrees at Harrington South to 55 degrees at Wallula. 0.58 inches of rain fell at Long Beach, and winds gusted to 37 mph at Alderdale. Overall, there were widely scattered showers and even some thunderstorms across the state. Highs on May 31st reached the mid 60s to 80s, with lows in the 40s to low 60s. 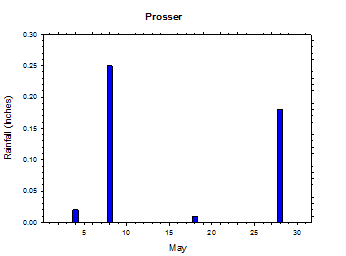 The average May temperature at Prosser (WSU IAREC) was 62.2°F, which is 2.5 degrees (1 standard deviation) above average. The average high temperature was 75.6°F, which is 3.4 degrees (1.1 standard deviations) above average. The average low temperature was 46.8°F, which is 1.4 degrees above average. The maximum temperature recorded last month was 87.5°F on May 22nd, while the coolest daily high was 63.6°F on May 9th. 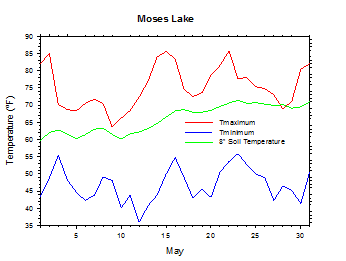 Low temperatures ranged from 57.8°F on May 16th to 38.4°F on May 6th. Daily average temperatures ranged from 71.5°F on the 16th to 53.8°F on the 10th. The monthly precipitation total was 0.46 inches. 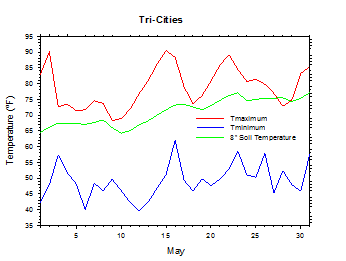 The average wind speed was 5.0 mph, and the average 8 inch soil temperature was 61.7°F. 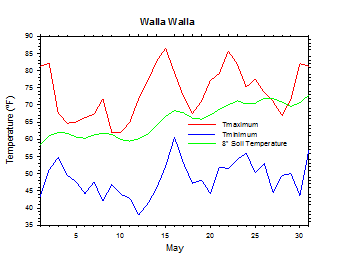 Wenatchee (WSU TFREC) recorded an average temperature of 63.4°F, which is 3.7 degrees above average, while Walla Walla's average monthly temperature of 61.1°F was 2.3 degrees above average. 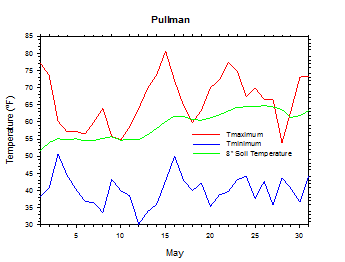 Pullman was one of the cooler spots in the state, with an average May temperature of 54.3°F. In western Washington, Mt. 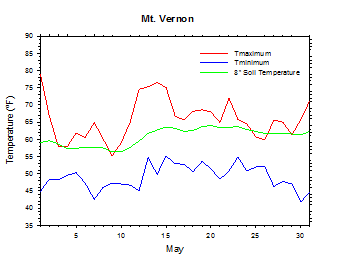 Vernon's average temperature was 57.1°F, which is 3.0 degrees above average. May 1st: The temperature at Seattle soared to 89 degrees. May 9th: 1.7 inches of rain fell at Stevenson. May 12th: The temperature at LaCrosse fell to 30 degrees. May 14th: The temperature at Long Beach rose to 89 degrees. May 17th: The temperature at Ritzville fell to 30 degrees. Despite a cold beginning, much of March was mild and somewhat active. Green Bluff's high temperature on the 1st was a mere 19 degrees, but Vancouver reached 62 degrees on March 3rd. From March 2nd to 8th, Montesano received nearly 8 inches of rain. An unfortunate consequence of the wet weather in the west was the March 22nd Oso landslide, which caused significant loss of life. Despite the preponderance of dry days in central parts of the state, Long Beach recorded only 5 dry days during the month. Overall, monthly temperatures were around 1 to 2 degrees above average. April was another mild but generally unremarkable month. The main highlight was the end of the month heat wave, which was noteworthy not only in terms of the absolute temperatures, but also for its unusually early and sudden arrival. Western areas recorded the greatest positive temperature anomalies for that time of the year. 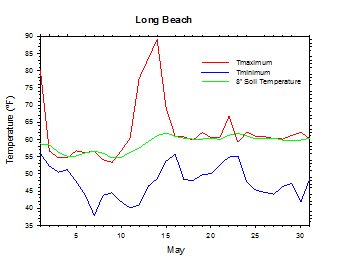 Long Beach soared from 58 degrees on the 28th to 88 degrees on May 30th. By contrast, the warmest temperature recorded during the summer of 2013 was just 75 degrees. Overall, Prosser's mean monthly temperature was nearly 2 degrees above average, which made April 2014 the warmest since 2000. 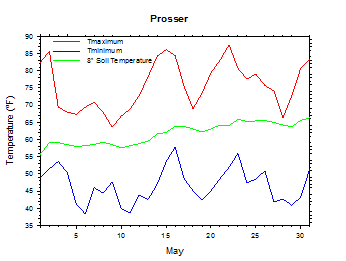 The average spring temperature at Prosser (WSU IAREC) was 54.1°F, which is 1.8 degrees (1.1 standard deviations) above average. The average high temperature was 66.2°F, which is 2.1 degrees (1.1 standard deviations) above average, while the average low temperature was 41.0°F, which is 1.5 degrees (1.1 standard deviations) above average. Daily high temperatures ranged from 87.5°F on May 22nd to 26.3°F on March 2nd. 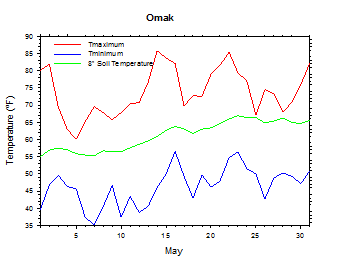 Low temperatures varied from 57.8°F on May 16th to 23.8°F on March 2nd. Daily average temperatures ranged from 71.5°F on May 16th to 25.0°F on March 2nd. 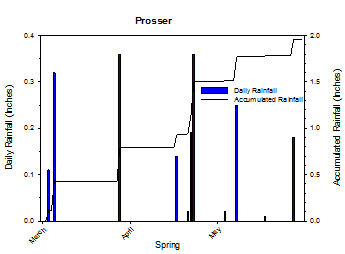 1.96 inches of rain fell during the spring season. 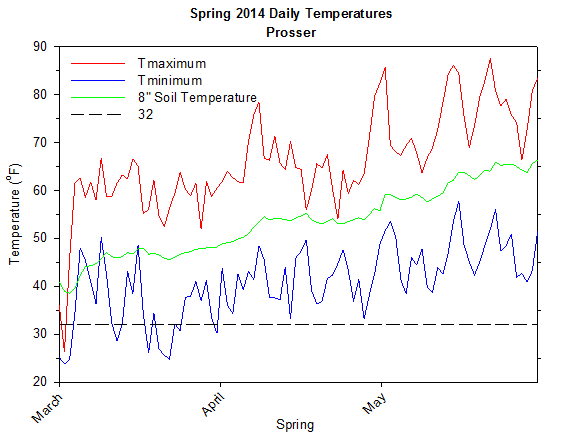 The average wind speed was 5.8 mph, while the average 8 inch soil temperature was 53.5°F. Other locations also experienced above normal spring temperatures. 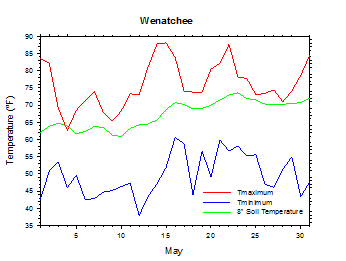 Wenatchee (WSU TFREC) had an average seasonal temperature of 53.3°F, which is 1.8 degrees above average. March 1st: The high temperature at Green Bluff was 19 degrees. April 14th: The temperature at Broadview plunged to 22 degrees. March: Mild, and wet in the west. During early May, asparagus harvest was in full swing, and most spring wheat and barley had been planted. As of May 12th, winter wheat crop damage became apparent, while vegetable crops in the Palouse region showed the effects of reduced moisture and cold winter weather. 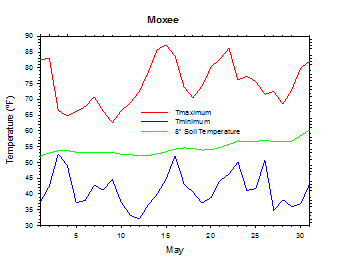 By May 19th, wheat was showing signs of heat stress in response to the warm and dry weather. Meanwhile, the planting of beans and sweet corn continued. Most crops were showing signs of drought stress by the end of May, and the planting of field corn began. In western Washington, tree fruit blooming was complete as of late May (National Agricultural Statistics Service). On May 10, 2013, the temperature at Hundred Circles soared to 97 degrees. According to the Climate Prediction Center (CPC), warmer than average temperatures are expected in Washington during June and into the early autumn, and then slight odds for above average temperatures continue well into 2015. Generally, no clear signal exists for precipitation. El Niño is currently developing, and is likely to persist into 2015. El Niño winters tend to be significantly warmer and somewhat drier than normal in Washington. However, this is especially true for areas from the Cascades and westward. In eastern areas, odds for warmer than normal temperatures are fairly strong, while odds are only slightly tilted toward drier than normal conditions.